in the Pecos people's lives. On the historic Santa Fe Trail, where the Pecos Indians once commanded the trade path between Pueblo farmers of the Rio Grande and hunting tribes of the buffalo plains, are the ruins of the Pecos pueblo and Spanish missions. Conflict and trade, the rise and decline of the powerful Pecos, the coming of the Spanish, the creation of the Santa Fe Trail, and the Civil War are all part of the story. Today, Pecos National Historical Park preserves over 12,000 years of history including the ancient pueblo of Pecos, colonial missions, Santa Fe Trail sites, 20th century ranch history of Forked Lightning Ranch, and the site of the Civil War Battle of Glorieta Pass. The Pecos Indians were an advanced tribe with a heritage deeply rooted in the Puebloan culture of the American Southwest. Like their Pueblo ancestors, the Pecos practiced ancient customs in agriculture, religion, and architecture. Farming was essential to their livelihood. By applying an ancient agricultural technique that had originated in Mexico, the people of Pecos were able to supply most of their diet of corn, beans, and squash. Farming also influenced the architectural design of the Pecos village, and like many Pueblo tribes of the American Southwest, the Pecos built storerooms to set aside food for the winter and checked dams to regulate the water that flowed to their crops. Their impressive architecture also included large multi-story houses built above the storerooms using adobe--a mud and straw-based material they mixed and molded together to look like bricks. To protect the village, the Pecos erected a large wall, which according to one Spanish conquistador, was visible from a far distance. The Spanish first encountered the Pecos when Francisco Vasquez de Coronado traveled to northern Mexico in search of the seven golden cities. The legendary cities, known as Cibola, attracted many explorers to the American Southwest once Cabeza de Vaca spoke of their existence after returning from his expedition in 1536. Hearing the tales of Cabeza de Vaca’s travels, in 1540 Coronado set out to New Spain’s northern frontier with an army of 12,000 with an aim to to claim these Native American cities. When Coronado and his men reached the village of Pecos, they did not find Cibola. Instead, they encountered a Plains Indian held captive at Pecos who told Coronado and his men about a land filled with the riches that the Spaniards sought. In the spring of 1541, Coronado and his men followed the Plains Indian to this mystical land called Quivira. After wondering for days through present day Kansas, Coronado killed the Plains Indian upon learning that the guide tricked them. 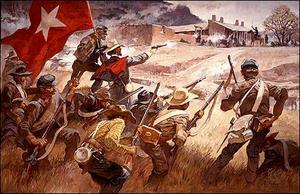 Having failed to find Cibola, Coronado and his men turned back and returned to Mexico empty-handed. Although Coronado’s expedition failed, the Spanish were still determined to colonize the Pueblo lands and convert the American Indians to Christianity. By 1598, the Spanish had crossed the Rio Grande. Under the leadership of Don Juan de Oñate, the Franciscan friars began to convert the people of Pecos. Initially, the Spanish missionaries failed. When veteran missionary Fray Andres Juarez arrived to Pecos in 1621, the relationship between the natives and the missionaries improved. Eventually, the Franciscans gained the trust of the Pecos Indians. Under the direction of Juarez, the Pecos and the Franciscan friars built an adobe church that was the most prominent of all of the New Mexico mission churches. The mission continued to succeed under the ministry of Fray Juarez, and from 1621 to 1634, the Franciscan missions expanded throughout New Mexico. Eventually, the missions would fail when church and civil officials began to compete for the labor and loyalty of the natives, which bred Indian resentment that eventually led to the Pueblo Revolt of 1680. After decades of the Spanish presence, numerous groups of Pueblo Indians united to drive the Spaniards from their ancestral lands in the Pueblo Revolt of 1680. Although some Pecos Indians were still loyal to the Franciscans, most followed their tribal elders in the revolt and killed the priests. The survivors of the struggle moved back to Mexico. The Spanish would not return to Pecos for another 12 years. When Diego de Vargas revisited the lost Spanish colony in 1692, he was awed by the warm welcome at Pecos and by the Indians’ willingness to assist the Spaniard in his quest to reclaim the American Southwest. After the people of Pecos supplied Vargas with 140 warriors, the Spanish recaptured Santa Fe and began to rebuild the mission. 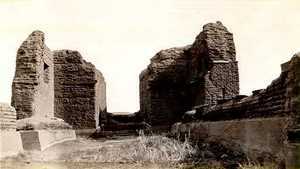 The Pecos and the Spanish erected a smaller church on the ruins of the old mission church, and together established a peaceful Spanish-Pueblo community. The serene environment in Santa Fe lasted until the 1780s, when disease and Comanche raids destroyed Pecos and reduced the population to less than 300. Survivors eventually left their decaying community, and in 1838, the Pecos joined their kinfolk at Jemez pueblo. the site of the Civil War Battle of Glorieta Pass. Pecos National Historical Park remains rich in Pecos culture and history. 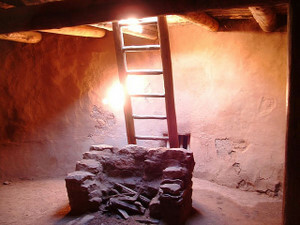 Visitors to the park can climb down into two kivas, the ceremonial and social spaces that the Pecos believed allowed them closer communion with the spirits of the underworld. Kivas continued to be a significant part of Pecos life even after the Spanish Franciscan friars established their first church, “The Lost Church,” in the early 17th century. Guided tours of the original structure of the Lost Church are one of the key attractions in the park. 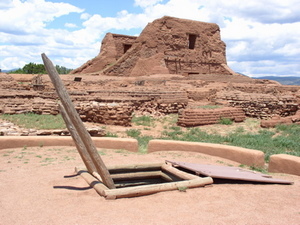 Tourists can also see the ruins of the Pecos Pueblo, mission churches, and the two reconstructed kivas by following the self-guided trail. Pecos National Historical Park, a unit of the National Park System and a National Historic Landmark, is located off Interstate 25, 25 miles east of Santa Fe, NM . Click for the National Register of Historic Places file: text and photos. Pecos National Historical Park Visitor Center and Trail are open daily from 8:00am to 6:00pm during the summer. The trail’s winter hours are from 8:00am to 5:00pm, and the visitor center closes at 4:30pm. The park is closed on Thanksgiving Day, Christmas Day and New Year's Day. There is an admission fee. For more information, visit the National Park Service Pecos National Historical Park website or call 505-757-7200. Pecos National Historical Park has been documented by the National Park Service’s Historic American Buildings Survey. Pecos is also featured in the National Park Service American Southwest Travel Itinerary and in the Places Reflecting America's Diverse Cultures: Explore their Stories in the National Park System Travel Itinerary.